A non-eugenol resin based temporary cement. Supplied in an easy-to-use automix dual barrel syringe with 15 HP mixers. The included releasing agent is specially formulated for easy removal of temporary cement. The material also comes in a 2-syringe format - Part A (base) and Part B (catalyst) to be mixed on a mixing pad. 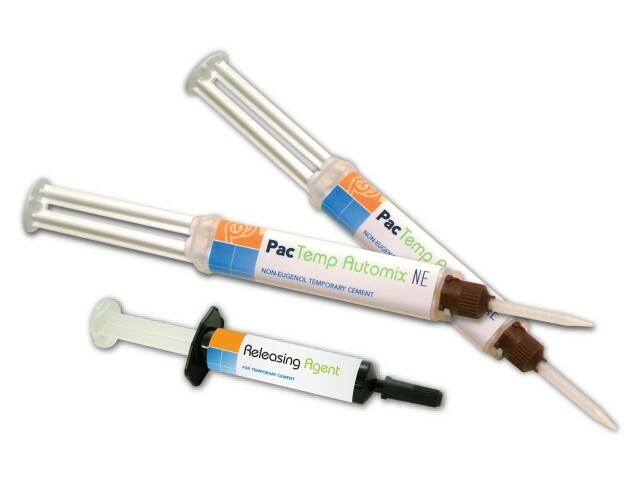 When the 2 parts are mixed, the material demonstrates the same outstanding characteristics as PacTemp™ Automix, NE.